JOSH REYNOLDS’ LATEST PRO SE DIGITAL SINGLE SHOT DEBUTS! 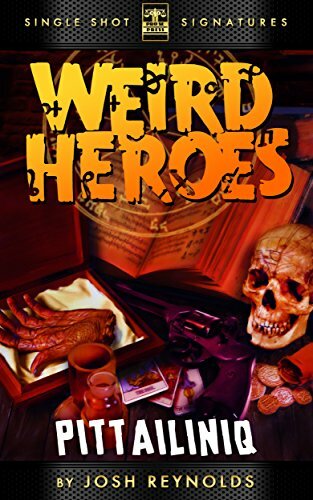 ‘WEIRD HEROES: PITTAILINIQ’ NOW AVAILABLE! Pro Se Productions proudly announces the latest story in noted author Joshua Reynolds’ Pro Se Single Shot Signature Series of digital short stories. Featuring a new strange protagonist from one story to the next, Joshua Reynolds’ WEIRD HEROES continues with a creepy tale of the frozen north! Something evil has taken hold of a trading post in the far north, something that has devoured every man, woman, and beast inhabiting the place. Now it is up to Ukaleq, an Inuit holy man, to put it right. The trading post has become pittailiniq, a sour, ruined place, and while it may be too late to save the people, Ukaleq might just be able to save the land – if not himself. Weird Heroes: Pittailiniq, the second short story installment of Joshua Reynolds’ Weird Heroes, a Pro Se Single Shot Single Signature series, features a captivating cover and logo design by Jeffrey Hayes and digital formatting by Russ Anderson. Get your digital copy of Reynold’s latest Sojourn into the Strange for only 99 cents for the Kindle at http://www.amazon.com/Pittailiniq-Weird-Heroes-Book-2-ebook/dp/B014C7AVFA/ref=sr_1_fkmr1_2?ie=UTF8&qid=1440651838&sr=8-2-fkmr1&keywords=joshua+reynolds+weird+heroesand for most digital formats at https://www.smashwords.com/books/view/571564. For more information on this title, interviews with the author, or a digital copy for review, contact Pro Se’s Director of Corporate Operations, Kristi King-Morgan, at directorofcorporateoperations@prose-press.com. CONSTANTINE’S LUTHER CROSS RETURNS IN ‘BLOODLUST’ LATEST PRO SE SINGLE SHOT SIGNATURE DIGITAL SINGLE DEBUTS!